A hard disk drive (also known as hard drive, hard disk, or disk drive) is a device for storing and retrieving digital information, primarily computer data. It consists of one or more rigid (hence "hard") rapidly rotating discs (often referred to as platters), coated with magnetic material and with magnetic heads arranged to write data to the surfaces and read it from them. Hard drives are classified as non-volatile, random access, digital, magnetic, data storage devices. Introduced by IBM in 1956, hard disk drives have decreased in cost and physical size over the years while dramatically increasing in capacity and speed. 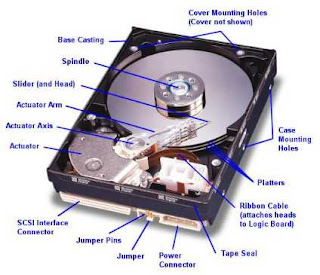 Hard disk drives have been the dominant device for secondary storage of data in general purpose computers since the early 1960s.They have maintained this position because advances in their recording capacity, cost, reliability, and speed have kept pace with the requirements for secondary storage.